The AEGIS PRO Series design provides reliable shaft grounding for large AC and DC motors, medium voltage applications, generators, and turbines to divert harmful shaft voltages to ground and extend bearing life. Install the AEGIS PRO on the DE and insulate the bearing on the opposite end (NDE) for best results. Large motors and generators often have much higher induced shaft voltages and bearing currents. The six circumferential rows of conductive microfiber provide the extra protection for these high current applications. How do you know if a motor is safe from destructive shaft voltages? For the first time you can get all of the tools you need in one kit. The AEGIS Shaft Voltage Tester Digital Oscilloscope bundle includes the AEGIS-OSC-9100 100 MHz digital oscilloscope, shaft voltage probe tips, and a shaft grounding simulator. Armed with these tools, you can quickly and easily find whether motors are at risk of premature bearing failure due to VFD-produced bearing currents. Variable frequency drives (VFD) on AC and DC motors induce harmful electrical voltages on the motor shaft. Once these voltages exceed the resistance of the bearing lubricant, they discharge through the motor's bearings causing fusion craters, severe pitting, fluting damage. 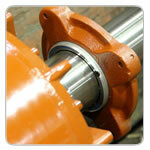 Excessive bearing noise and eventually bearing failure is the result. Current diversion in the form of the patented AEGIS shaft grounding is needed to make these motors sustainable. The AEGIS Shaft Grounding Ring prevents electrical bearing fluting damage by safely diverting harmful shaft voltages and bearing currents to ground. Using proprietary Electron Transport Technology, the conductive microfibers inside the AEGIS Ring provide the most reliable current diversion technology for shaft grounding with a "path of least resistance" to dramatically extend motor life.